DURBAN, South Africa Leaders of the five BRICS nations fueling global economic growth agreed Wednesday to create a development bank to help fund their $4.5 trillion infrastructure programs -- a direct challenge to the World Bank that they accuse of Western bias. Few details and no figures were given, indicating that many issues still need to be resolved. The bank will use $50 billion of seed capital shared equally between Brazil, Russia, India, China and South Africa, but will undoubtedly be dominated by China, according to officials at the conference, who insisted on anonymity because they are not authorized to speak to the press. The development bank will be the first institution of the informal BRICS forum which was started in 2009 amid the economic meltdown to chart a new and more equitable world economic order. "Russia supports the creation of this financial institution," said President Vladimir Putin on Wednesday, but he cautioned "we believe that, if it is created, then it must work on market principles only and support the business of all our countries." Host President Jacob Zuma, whose country is lobbying to be home to the bank, said the formal negotiations to establish the institution were "based on our own considerable infrastructure needs, which amount to about $4.5 trillion U.S. dollars over the next five years." The bank will also cooperate with other emerging market countries and developing economies. Zuma said the bank also will establish a "BRICS contingent reserve arrangement," a pool of money to cushion member states against any future economic shocks and further lessen their dependence on Western institutions. Both those aims challenge the traditional roles of the World Bank and the International Monetary Fund, institutions that in their 50-year life have been dominated by the United States and Europe. "As cooperation between the BRICS becomes more increasingly institutionalized, it will begin to challenge the economic architecture set out by the Bretton Woods institutions, regarded by many policy-makers within the BRICS as obsolete and biased toward the developed world, " analyst Martyn Davies of Frontier Advisory wrote this week. "The underlying motivation within the BRICSs is to assert their own collective interests, hard though they are to define, and do so against established Western ones." While Zuma was keen to "take this proposal (on a development bank) further to fruition," Putin indicated more work was needed, saying "Russia believes this work can be continued ..."
Many technical issues remain to be resolved, Brazil's foreign trade minister Fernando Pimentel said before the start of the two-day summit, which ends Wednesday. They included the voting structure of the bank's board, he said. While BRICS nations emphasize their equal partnership there is no doubt about the dominant role in trade and investment played by China, the world's most populous nation and its second largest economy which recently overtook the United States as the biggest importer of oil. China also has the world's largest foreign exchange reserves. This BRICS summit has been dedicated to supporting development in Africa -- Zuma invited 15 other African leaders to the meeting -- and analysts note that some BRICS nations are rivals in the scramble for Africa's resources. China long as overtaken traditional former European colonizers as Africa's biggest trading partner. Recently there have been rumbles about the nature of China's investment in Africa. Botswana's President Ian Khama last month lambasted China for shoddy work in his country, saying "We have had some bad experiences with Chinese companies." In an interview with South Africa's BusinessDay newspaper, Khama blamed Chinese companies for a spate of power cuts he blamed on Chinese construction of a power plant that is months behind schedule. Khama also expressed concern about the rate of Chinese migration to Africa in the interview, saying "We accept China's goods. But they don't have to export their population to sell us those goods." And in a recent opinion piece the governor of Nigeria's central bank, Lamido Sanusi, accused China of being "a significant contributor to Africa's de-industrialization and underdevelopment," with its cheap manufactured goods competing with African goods on the continent and its huge appetite for raw materials preventing Africans from adding value to their natural resources. He suggested there was a "whiff of colonialism" about China's Africa policy. China's new leader Xi Jinping, attending his first international summit at the BRICS, said China would "support Africa's efforts for stronger growth." He said China would continue to make its own and international development priorities as it works to achieve a "grand goal" of doubling China's gross domestic product and the per capita income of its population by 2020. Other leaders at the summit, in South Africa's coastal resort of Durban, gushed about the possibilities opened by their fledgling BRICS forum, which represents nearly half of the world's population and more than a quarter of world trade. India's trade minister Anand Sharma said BRICS will "have a defining influence on the global order of this century." He warned against trade protectionism, which has played out within BRICS with South Africa accusing Brazil of dumping poultry products. 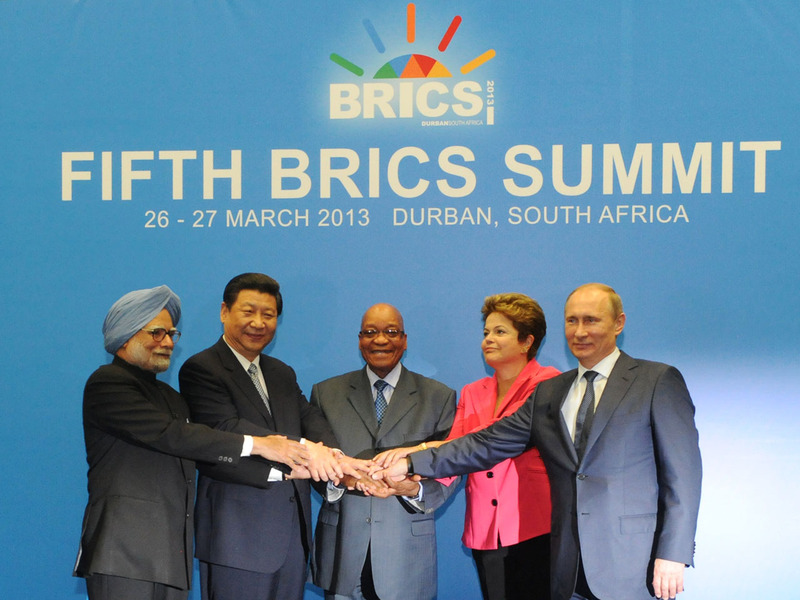 Brazil's President Dilma Rousseff said BRICS has confounded its critics. "Even the most skeptical voices do recognize the contribution the BRICS bloc of countries has provided in the field of international economics," she said. Even the World Bank has said that global growth over the past few years and for the foreseeable future is being driven by the bloc. Rousseff said it is time multilateral institutions like the IMF and World Bank become more democratic to clearly reflect the growing influence of developing countries.